Rule #1: We must have fun. The alternative is not an option! Rule #2: Alleviate stress for all in earshot. 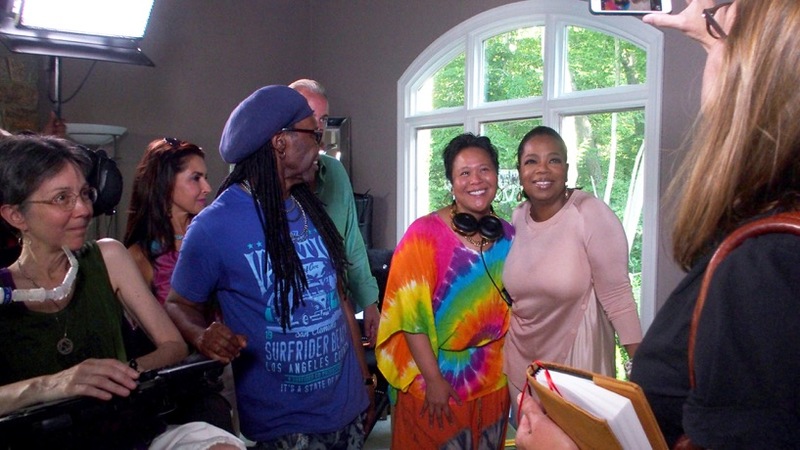 If your DJ can make Oprah do the robot, and Nile Rodgers smile, you’re going to have a great party. Rule #3: Stand For Something. Nicknamed the Pied Piper at the Womens March on Washington DC, I lead crowds from RFK stadium to the main stage, walking ten miles throughout the day with my DJ booth strapped to my body. I wanted to help amplify women’s voices and play music by women who could not be there, but definitely would if they could, such as Sharon Jones, who we recently lost to cancer. At least I could make her voice be heard too, through her music. Rule #4: Music Heals and Vocoders Rock! My Survivor brother in music, Nile Rodgers, and I are on the same page about music and survival, while Russel blows minds with his more robotic side. Rule #5: Combine Music and Art when possible. Music and Art means play. Rule #6: Don’t forget the eyes! Have you considered hiring a Video DJ? Adding a visual element to your event creates an impressive experience for your guests. Custom videos can be made to mix with your favorite music videos. Listening to your favorite song is one thing; watching the video excites people (and comforts guests who are uneasy at gatherings). Rule #7: Dance, Dance, Dance. Being on stage with CHIC and Nile Rodgers, staring out into the world, has taught me the power of music, dancing, and singing… the universal languages of FUN. Rule #8: DJ for the people and get to know them. When I DJ a latin party, everyone goes ¡platanos! FEATURED PARTY (YES, SHE PUT FIRE ON HER HEAD.) Everyone danced for hours. What a great night. Check out my belly dancing sisters Zavivah Dancer and Annalise Aziz from my DJ booth at Cipriani and get to know Vanity-4-Humanity, a wonderful organization headed by Dr. Donald F. Roland and Fatima Roland…Vanity-4-Humanity gives back what was lost in the form of reconstructive surgeries to women in third world countries, as well as sets up education for orphans in Haiti… give some love and support, check out Vanity-4-Humanity. Does your party needs bellydancers? I got ’em. Rule #9: Keep it exciting and others come to life. The last thing you want is a DJ who is secretly bored. I keep it exciting for all and let people express themselves. Rule #10: Have Music Will Travel. All I need is electrical outlet and I can set up anywhere. From banquets to boxing rings, you bring the funk, I’ll bring the noise. Rule #11: Make Surprises Happen. DJs write the soundtrack to life’s most important events. Great DJs help write history via music. A Truly Happy New York City Moment—something so beautiful and magical happened in New York recently…LOVE won! DJ CherishTheLuv and her team coordinated Danny & Sarah’s Lion King Proposal, with the help of the NYPD who set the scene for an epic and beautiful surprise marriage proposal in Times Square NYC, in front of The Lion King on Broadway, where they had their first date, exactly one year prior. 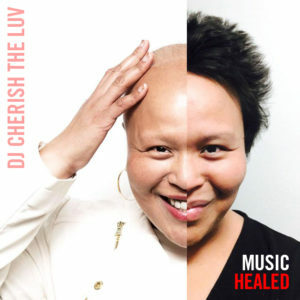 Contact DJ CherishTheLuv to surprise the love of YOUR life, too! Rule #12: Honor artists from the DJ booth. Without your talent, I’d be playing dead air. The Sisters of Comedy show gave me a buzz and invited me onto their show at Carolines on Broadway to close out the Prince tribute night with stories of DJing, funny drunken song requests, and healing cancer through music. I often feel an honor playing tracks by others, and I appreciate the hard work it took to get their music in my hands, and into the feet of my audience. Rule #13: Celebrate New Beginnings In A Big Way. New Beginnings are what living life is all about. Nothing compares to throwing confetti on Mariah Carey and tourists. I am one of those people who delivered the confetti at Times Square for New Years, my biggest party ever (so far! ), an extremely high-security situation, celebrating with the entire planet. It was at this night where my desire to work in events of all sizes was born. I love my NYC, and Times Square is my wild, magical playground. Rule #14: Put Down The Computer. Sometimes you’ve gotta just play vinyl and only vinyl! You’ll find me spinning Vinyl Only Always at Stanley’s Pharmacy on Ludlow Street in NYC, simply the most excellent pharmacy and juice bar on this planet. I always bring triangles with me, so you can jam along. Rule #15: Give Your Employees A Break. Your dedicated workerbees need to let loose! Good thing I have all the right music that makes them go nuts like this and de-stress. Rule #16: Combine Music with Food & Drink always. Didn’t know Whole Foods had a DJ? Now you do! I just opened the Whole Foods Bryant Park NYC location. If you are in Midtown NYC, you must bring your hungry and thirsty self there. Rule #17: Let People Express Themselves. My 87-year old DJ student, DJ Lee Lee, knows the importance of self-expression. Rule #18: Let The Music Make You Cry. Sometimes I have to shed tears at the DJ booth… like when George Michael dies and you get the entire bar singing FREEDOM in his honor. I mean, honour. Rule #19: Play Well With Others! DJs who work well with others will work well with you and all of your guests! If you loved DJ AM (RIP) and Travis Barker, you may enjoy me and my drummer, the famous Swiss Chris for your event. He’s toured with John Legend, Gloria Gaynor… oh so many… just google him, my brother from a rhythmic brother and watch the video below. This video from my gig at House of Yes shows one of my favorite things about DJing–the folks who stay beyond the end. They always have the best energy, even at 4 in the morning. Rule #21: Take The Music On The Road! You needed a party on wheels, right? Well, I got you! I’ve got a bus with a DJ booth on hand. Contact me to hire my mobile bus party unit. You definitely need to get yourself an awesome New York experience like this that you and your guests will hashtag “epic” forever. Rule #22: This Is How I Do Politics. Hello Washington DC! Ryan Seacrest Civic hired DJ CherishTheLuv to close out the night for TBS Samantha Bee’s Not The White House Correspondents Dinner, sharing the stage with Elvis Costello. Big love to The Black List. Rule #23: New Orleans rocks. DJing for Viacom Comedy Central crew is always a treat, and the joy of NOLA can’t be beat. Rule #24: Love Your Family. Rule #25: Lift Each Others’ Talents. As a DJ, it is my joy and honor to lay the sonic groundwork for others to be free on the mic. Whether it is when the DJ booth is strapped to my body and we can be “doin’ it in the park” or I bring my talented friends on air, lifting each others’ talents is pure joy. Rule #26: Rock it out with extra layers. You’ll often find me drumming alongside my mixing to add an extra layer of energy. Rule #27: The world is your sandbox, woodshed, laboratory. In the laboratory with my Japanese brother, legendary DJ DR. Koyama, owner of Rhythm Cafe, Tokyo, one of Japan’s oldest and most respected DJs; a veteran from the NYC 70s 80s house music scene. We examine new music and figure out its samples from classic house music. Total playground. Rule #28: Give Back. Teach. And You Will Keep Learning. Teaching self-expression under the guise of DJing to teenage girls at an orphanage in Ecuador is one of the most important things I have ever done. Teaching young females how to express themselves, to be loud when they need to, I believe, saves lives. Helping women learn how to express themselves via sound teaches them how to speak up, say “no,” and ask for things like a raise. I was able to bring a router from NYC, so now the orphanage has internet access and they can search the web for new music and all of their favorites! Teaming up with legendary audio recording engineer and producer, Erwin Musper, I’ve created this video to show your what our world of children is like, and show you how you can help, too! I’ll keep the good times comin’ if you keep showing up!